World Poetry Celebrates the Talented ALARA BRETANNE! Ariadne’s Notes: Happy International Women’s Day! A special celebration with Alara Bretanne and e-poets: Vani Pradeep, India, Ceri Naz, Philippines and Alaha Ahrar, Afghanistan , US. Also included were Alfonso Pretel , Spain and Michael Collins, Australia. 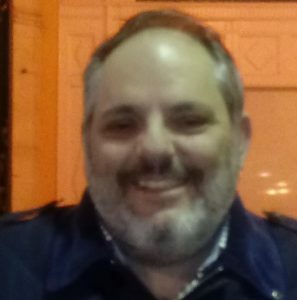 Super tech Victor Swartzman sang Happy Birthday to the women of the world. Missing was Craig Earqhart who was not able to join us since he was in the hospital but we played his UCLA heart transplant song . Music by John Lennon , Susan Cogan and Craig Earqhart. Thanks to Osiris Munir. Sharon Rowe’s story, the Great Switch a Roo was dedicated to her friend Stuart who passed away recently. For years we have had a special event for International Women’s Day but were not able to this year. However this radio show made up for it. Thank you all! CLICK HERE TO LISTEN TO THE SHOW ! 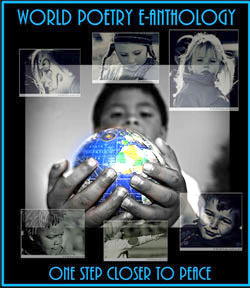 Alara was involved with World Poetry, The Millenium Writers Group, and was featured as a guest poet on World Poetry’s radio station in Vancouver, BC. 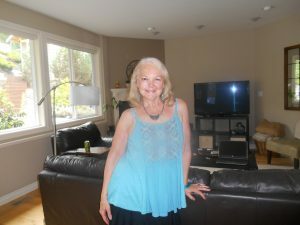 In 2011, upon moving to Vancouver Island, BC, she joined the Cowichan Writers Group and began writing short stories. Poetry and short stories were published in the Anthologies “One Brick Shorts” in 2013 and “Love Notes” in 2016. 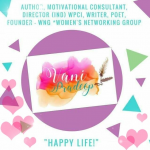 “The poem I selected to send was a “Goddess” poem to have a feminine style of prayer since much of our current religion is more masculine based, although I can see that changing. September 24, 1993, The Center, Kamloops. All rights reserved by the author. This entry was posted in Ariadne's Notes, E-Poets, Featured Poets, General and tagged Alaha Ahrar, ALARA BRETANNE, Alfonso Martinez Pretel, An, Author Sharon Rowe, Craig Earqhart, International Peace Award Ariadne Sawyer, John Lennon, Michael Collins, Osiris Munir media, Susan Cogan, Vani Predeep, Victor Schwartzman on March 12, 2018 by Ariadne. 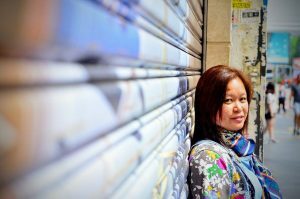 World Poetry Celebrates Satoko Fujii From Japan! Ariadne’s Notes: The World Poetry Café Radio Show on February 8, on CFRO 100.5 PM at 1:PM, PST welcomed with a surprise special birthday party for the renowned pianist and touring composer, Satoko Fujii with her solo 60th birthday CD with welcoming guests Yurie Hoyoyon and Soramaru Takayama in Japanese and English. It was so much fun! Also a number of guests, including an e-peace poem from e- features: Malik Ahmed and the multilingual poet Alfonso Martinez Pretel from Spain. Other guests included the amazing poet Barry Plamondon reading from his new book. World Poetry Team: Ariadne Sawyer, MA, Victor Schwartzman and Sharon Rowe. “Fujii is clearly one of the most exciting musicians to come along in a while.” ― Robert Iannapollo, Cadence. Born on October 9, 1958 in Tokyo, Japan, Fujii began playing piano at four and received classical training until twenty, when she turned to jazz. From 1985 to 1987, she studied at Boston’s Berklee College of Music, where her teachers included Herb Pomeroy and Bill Pierce. She returned to Japan for six years before going back to the US to study at the New England Conservatory in Boston, where her teachers included George Russell, Cecil McBee, and Paul Bley, who appeared on her debut CD Something About Water (Libra, 1996). Since then Fujii has been an innovative bandleader and soloist, a tireless seeker of new sounds, and a prolific recording artist in ensembles ranging from duos to big bands. She has showcased her astonishing range and ability on more than 80 CDs as leader or co-leader. With each recording or new band, she explores new aspects of her art. Between 1997 and 2009, her New York trio with bassist Mark Dresser and drummer Jim Black released seven critically acclaimed CDs. Cadence magazine described the group as “Beautiful and exciting by turns, and sometimes both at once.” Jason Bivins in Signal to Noise praised the “dynamite unit” for its “improv delirium, hot grooves, and melodic dances.” In 2004 Fujii’s husband, trumpeter Natsuki Tamura, joined the trio to form the Satoko Fujii Four, which released the critically acclaimed Live in Japan 2004 and 2006’s When We Were There. At the same time, she and Tamura began documenting their intimate duo music. By now, the pair has made five CDs for various labels in Europe and Japan. In his four-star DownBeat review of Chun (2008), Ted Panken wrote, “Fujii’s orchestral technique, clear chromatic lines and ‘prepared piano’ devices contrast effectively with Tamura’s arsenal of extended techniques which he executes with a warm, vocalized tone throughout the trumpet’s full range.” Their sixth duet album is due out in 2017. In 2001 came the radically different Vulcan (Libra Records), an avant-rock/free-jazz fusion album by a new group, the Satoko Fujii Quartet featuring Tatsuya Yoshida of the Japanese avant-rock duo, The Ruins. “The sensibility here is aggressive to the point of primitive,” said Bill Bennett in JazzTimes. “Vulcan is … a masterpiece of jazz expression.” Between 2001 and 2007, each of the Japanese quartet’s five albums, including Zephyros (Polystar, 2004) and Angelona (Libra, 2005), received equally enthusiastic approval. Toh-Kichi, her duo with the quartet’s drummer Yoshida, released CDs in 2002 and 2004. Even as she led these disparate small ensembles, moving with equal vigor in widely divergent directions, Fujii also embarked one of the most important aspects of her career―composer, leader, and soloist with some of the most innovative large jazz ensembles of the past twenty years. Cadence magazine dubbed her “the Ellington of free jazz.” In 1996, she founded Orchestra New York, which boasts the cream of New York’s contemporary avant-garde improvisers, including saxophonists Ellery Eskelin and Tony Malaby, trumpeters Herb Roberton and Steven Bernstein, and trombonist Curtis Hasselbring, among others. Over the course of seven albums, Fujii has “reinvigorated the big-band concept for the new century – and placed herself at the forefront of the style at the same time,” according to Marc Chénard in Coda. However, Fujii’s creative ideas for large ensemble cannot be fully encompassed by a mere two big bands, and she has gone on to work with two others―Orchestra Nagoya, with which she has recorded three CDs since 2004, and Orchestra Kobe. In 2006 she released an unprecedented four big band CDs―one by each of these orchestras―at one time. Even four orchestras are not enough for the prolific composer-improviser. At the 2013 Chicago Jazz Festival she premiered a fifth big band, the Satoko Fujii Orchestra Chicago. In 2014, she added Orchestra Berlin to her growing list of large ensembles, and recorded Ichigo Ichie. The album “swells in oceanic crests from which its musicians soar wildly. The four-part title suite repeatedly builds to thrilling, noisy, near-hysterical climaxes,” wrote Derk Richardson in The Absolute Sound. In 2013, Fujii set off on a fresh musical adventure with the Satoko Fujii New Trio, featuring bassist Todd Nicholson and drummer Takashi Itani―her first piano trio since 2009. The group released their debut recording, Spring Storm, that same year. “It is tempting to say the very focused, often gorgeous and always thought-provoking Spring Storm―with its delicacy versus strength dynamic, and melodic beauty beside the articulate and challenging interplay―is her best work to date,” wrote Dan McClenaghan in All About Jazz. With the addition of trumpeter Tamura in 2014, the trio expanded into a quartet called Tobira and toured North and South America. Their debut release, Yamiyo Ni Karasu, “rises to the top tier of her sprawling discography,” according to Steve Greenlee in JazzTimes. In addition to leading her own ensembles, Fujii has engaged in many collaborative projects and ad hoc groups, and appeared as a member of ensembles led by others. With violinist Carla Kihlstedt, she has made two CDs, including Minamo, which Ben Ratliff of the New York Times says “is extraordinary, a series of tight, dramatic events.” She has also released a limited edition duo recording with pianist Myra Melford, Under the Water. A meeting between Fujii and Tamura and Dutch pianist Misha Mengelberg and trumpeter Angelo Verploegen is documented on Crossword Puzzle. Her recent collaboration with bassist Joe Fonda, documented on 2016’s Duet, was called “miraculous” and “a bravura performance” by All About Jazz. 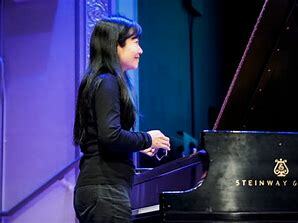 Increasingly since 2013, she and Tamura are joined by special guests, such as laptop musician Ikue Mori and British guitarist John Russell, as they tour around the globe. She has also toured and recorded with saxophonist Larry Ochs’ Sax and Drum Core, and appeared on albums by drummer Jimmy Weinstein, saxophonist Raymond McDonald, and Japanese free jazz pioneer, trumpeter Itaru Oki. She is a regular member of Tamura’s groups, Gato Libre (in which she plays accordion) and First Meeting, and played synthesizer in his quartet between 2002 and 2004. 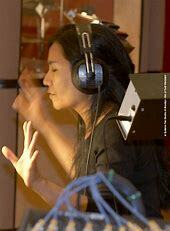 In recent years she has worked with dance and music ensembles featuring percussive dancer Mizuki Wildenhahn. Dos Dos includes Wildenhahn and percussionist Faín S. Dueñas, a founder of the Grammy-nominated Radio Tarifa; Hakidame ni Tsuru features trumpeter Tamura, as well as percussionist Takaaki Masuko, and guitarist Usui Yasuhiro. The cooperative group that currently claims most of her attention is the international quartet Kaze, featuring Fujii and Tamura along with trumpeter Christian Pruvost, and drummer Peter Orins from France. Kaze has earned wide acclaim. As Virginia Schaefer said of a live show she covered for JazzTimes, “Intense and playful, down-to-earth and international, Kaze communicates in a musical language of contrasts and continuity.” Jon Garelick writes in Giant Steps, “Kaze takes jazz abstraction to a sublime limit…. There is suspense, virtuosity, mystery, calm.” Their debut recording Rafale (2011) earned acclaim from Mark Medwin in The New York City Jazz Record, as “a stunning achievement from note one…” Their second CD Tornado (August 2013), earned similar acclaim. In 2015, they released their third album, Uminari, which Jazz Magazine (France) called, “a compelling example of free jazz today. Compositions are perfectly scripted, with a well-oiled interaction and playing of beautiful power…” In addition, Kaze appears as special guests with Orchestra Tokyo on their 2016 release, Peace. In 2016 Kaze expanded to include a second pianist, Sophie Agnel, and a second drummer, Didier Lasserre, to become Trouble Kaze, which released an album in early 2017. Fujii tours as relentlessly as she records. She has appeared live on every continent except Antarctica, performing at festivals, concert halls, and clubs. In 2013, she was honored with three nights on which to present her music at the Bielefeld Festival in Germany. In August and September of that year, she presented a week of music by several of her bands at The Stone in New York City. The year 2016 marked Fujii’s 20th anniversary in music as well the 20th anniversary of Libra Records, which has released most of her recordings. To celebrate, she embarked on a worldwide tour that included completely improvised solo concerts once a month in Europe, the US, and Japan; concerts in which she and Tamura were joined by special guests; and performances by several of her small and large ensembles, past and present. This entry was posted in Ariadne's Notes, E-Poets, Featured Poets, General and tagged Alfonso Martinez Pretel, Author Sharon Rowe, Barry Plamondon, International Peace Award Ariadne Sawyer, Satoko Fujii, Soramaru Takayama, Victor Schwartzman, Yurie Hoyoyon on February 15, 2018 by Ariadne.